The Leaf label have recently released the brand new album by New York City-based composer Julia Kent. The record is entitled ‘Character’ and is undoubtedly one of 2013’s finest releases that will be on many end-of-year polls come the end of the year. The amazing new record consists of Kent’s shape-shifting cello-based compositions, where the composer uses looped and layered cello, electronics and field recordings to explore the human space. On ‘Character’, Kent’s cello-based compositions take on this life of their own and soon, without any realization, the music becomes part of you, and seeps beautifully into your consciousness. The result is a moving body of work that breathes an ocean of emotion. ‘Character’ is utterly transcendent; where the heavenly layers of cello truly awaken all of your senses-the effect of Kent’s music is deeply profound. An unspoken connection is formed between the listener and the composer. The result is nothing short of magical. After years spent performing and recording with other artists and groups (most notably Antony and the Johnsons) the Canadian-born (New York City-based) Julia Kent found her own voice with her solo debut, ‘Delay’. Her follow-up ‘Green and Grey’ continued to use looped and layered cello, electronics, field recordings to explore the intersections between the human world and the natural world. Kent has also composed a number of original film scores and her music has been used as accompaniment to dance and theater performances. The latest ‘Character’ is Kent’s most accomplished work to date, whose intricate arrangements and divine melodies inhabits a magical realm of enchanting sound. Kent recorded ‘Character’ alone in her home studio. The intimacy is clear to witness, as hope and solace exudes from each cello note and found sound. The flow of intertwining cello motifs and Kent’s specialized layering techniques makes ‘Character’ an innovative and compelling sonic journey. The found sounds etched across the canvas of sound offers contrast to the cello, and serves to complement the music. I love how you can feel Kent’s love and attention to detail for recording and looping her beloved cello instrument throughout ‘Character’. The music forever travels in unexpected directions-new horizons are endlessly reached. Album opener ‘Ebb’ consists of slow-stirring strings that gorgeously build into an intense swirling of emotion. A beautifully delicate pizzicato accompaniment returns throughout-forming the rhythmic pulse to this short piece. Upon first listening to Kent’s music, you are immediately immersed into the ebb and flow of Kent’s layered cello and drawn to a new world. ‘Transportation’ sees the many intricate parts evolve before your very ears-where the sum of the parts form one organic whole. Allow your conscience and senses be awakened by the otherworldly bliss of this piece of music. Next is ‘Flicker’ which is reminiscent of Michael Nyman. The uplifting melodies transport me to Philippe Petit’s high-wire walk across the Twin Towers in the 70’s. A stunning composition. The spirit of Bach’s cello concertos are present-drifting somewhere close by, where a flicker of ancient light shines forth. ‘Tourbillon’ blends the synthetic and the organic. Strings and electronics are in constant motion, resulting in a wonderful climax of soaring strings. The momentum of this piece stops you in your tracks. The tempo slows on ‘Fall’, which contains mournful strings set to found sounds of ocean waves. The piece gradually intensifies with bowed strings forming rippling patterns on the sonic canvas. ‘Kingdom’ begins the second half of ‘Character’. This dark and menacing instrumental wonderfully combines an array of sound effects, field recordings and cello instrumentation. The experimental nature of ‘Kingdom’ and the cinematic atmosphere thus formed is similar to that of Leaf Label’s Murcof and The Haxan Cloak. An eerie landscape pierces the very air’s atmosphere. ‘Only Child’ is stunningly beautiful. The piece feels as if it’s a dream upon waking that effortlessly permeates your every thought. The element of electronics shifts to the foreground on ‘Intent’. A compelling piece of music where the synthetic and organic magnificently blend together. My current favourite is the album closer ‘Nina And Oscar’. An unerring emotional depth forms the foundation to this heart-warming composition. The cello strings are a pure joy to savor and absorb its magnificent beauty-a fitting close to this remarkable record. ‘Character’ is a work of rare beauty from a gifted composer. 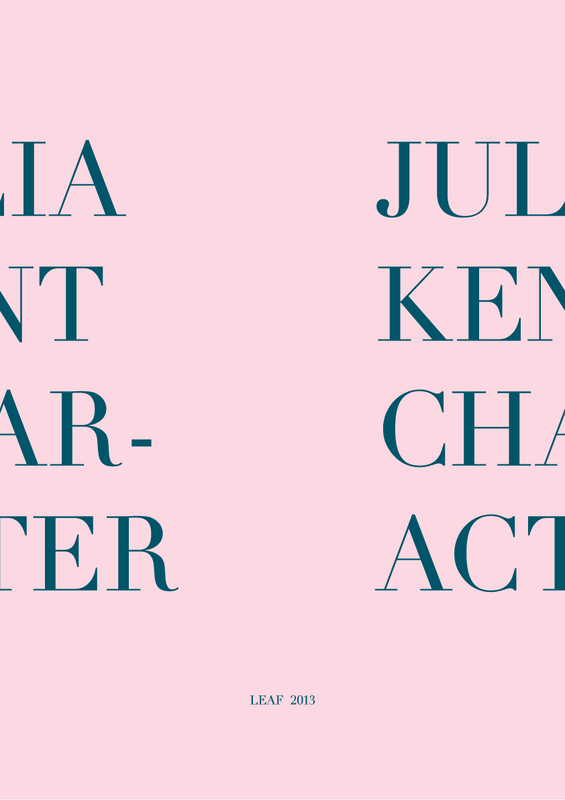 ‘Character’ by Julia Kent is out now on the Leaf label. Congratulations on the amazing new record ‘Character’. You must be deeply proud of this one. The cello-based compositions take on this life of their own and soon without any realization, the music becomes part of you, and seeps beautifully into your consciousness. Thank you so much, Mark! And thanks for the beautiful and perceptive questions…. Please tell me about this new third solo album? What is the central theme that connects these wonderful pieces of music together? I was inspired by the idea that we are all, in a way, characters in the narrative that is our life, but that we aren’t able to control that narrative as an author might. So the record is meant to reflect the paths we take through life, and how that journey can end up. I was interested to read how you recorded ‘Character’ alone in your home studio. This is not surprising to me, as the sound you conjure up feels as if it’s performed from a distant shore- far removed and in turn, possesses a profound sense of hope and solace. Please discuss your recording process and describe please the home studio where the sound is born? I feel very free when I record at home–it’s an intimate and creative environment for me, where I can control the process, and spend as much time as seems needed to make the music. My studio is just a cluttered spare room–I’m hoping all the bits and pieces that are stored there, almost floor-to-ceiling, are creating a sort of pseudo-acoustical treatment that lends a particular character to the sound! My current favourite on ‘Character’ is the fourth piece of music, entitled ‘Tourbillon’. I love how the cello motif returns throughout, and the looping of the strings combined with the electronics is stunningly beautiful. It’s a symphony that breathes an ocean of emotion. Please discuss the process by which you loop your cello parts and the technique involved in layering sounds together? I develop the pieces using looping, as that is how I recreate them live, but, when I record, I have to recreate the looping process using multitracking. So it’s very much a process, and the music definitely evolves through it. I do really enjoy the process of layering, and sometimes I end up with unexpected harmonic conjunctions that take things in an interesting direction. But I am also always trying to create space within a process that is inherently additive. “Tourbillon” of course refers to the watch mechanism that counters the effect of gravity and also to the idea of turbulence, like that of a whirlwind. I had this image of rotation and swirling, both mechanical and natural. I adore the piece ‘Transportation’. As ever, your music taps into a hidden dimension where a divine ambient flow is present. I love how the piece builds and builds, with familiar motifs returning to and fro. Can you talk me through the construction (or de-construction) of this piece please? Oh, thank you! “Transportation” began with a pizzicato accompaniment part and a layered melody, and the other parts evolved as the piece grew. I wanted to create a sense of constant movement, with elements appearing and disappearing the way they might, visually, on a busy street. And I also wanted to evoke idea of transportation in a more metaphorical way, in the sense of being carried away. You have been an integral part of the amazing Antony and the Johnsons. ‘I Am A Bird Now’ was one of those rare albums that breathes such power and raw emotion. Your cello playing serves the perfect counterpoint to Antony’s voice. I would love to gain an insight into this special collaboration and what hold this venture must have on you for your solo work? It has been a great privilege and a joy to play with Antony. He is an amazing artist and a very special and beautiful human being. I’ve learned so much from playing with him and the wonderful musicians he draws to him. As a cellist, please discuss the endless possibilities of music as you see (and hear) it? For me, music is really about communicating, and the kind of instrumental music I make is a way of expressing emotion without words. I feel really fortunate to be able to travel and play, as I do; I’ve had some wonderful encounters all over the world. Of course it’s a bit of a cliché to say that music is a universal language–but it truly is. Through music you can communicate with anyone. What are the albums that have inspired you the most? The past few years marks a golden age I think, for modern classical music with labels such as Erased Tapes, Bedroom Community, Leaf, Preservation etc introducing hugely remarkable artists such as yourself, and many other amazing people. It must be a beautiful situation to be part of this era? I am really so happy to be working with Leaf; they are an amazing label and I’m really lucky they released “Character,” which is a particularly special record for me. As you say, it’s a great time for instrumental music; there are so many beautiful records that have been released over the last few years. In terms of personal inspiration, I constantly return to people like Arthur Russell, Tom Cora, and Ernest Reijseger: cellists and composers who radically advanced the cello as an expressive instrument. ‘Only Child’ is such a compelling piece of music. I love how the bass notes are looped throughout that marks the familiar, whilst heart wrenching strings drift magnificently beneath. What sound, feeling or otherwise triggered the birth of this piece? “Only Child” is definitely a bittersweet piece of music, inspired by mixed emotions. But, at the same time, I love to play it, because it just seems to flow in a natural way, which is the way it developed as a piece. Often, because of the technological constraints of the way I loop, I feel constrained to work with symmetrical phrases. But “Only Child” seems to have escaped that, somehow. It just wanders on! You use found sounds in your music. I think you used sounds from airports on your debut. What are the sources of these sounds found on ‘Character’? For “Delay” and “Green and Grey,” my previous full-lengths, I used field recordings from particular environments: airports and the natural world, respectively. For “Character,” the found sounds are much more internal: I used a lot of different sound sources and then processed them to make them not immediately recognizable. I was trying to create an electronic/organic mixture that would complement the music, which is definitely more inward-looking, rather than bringing in the idea of an outside environment. ‘Intent’ is more electronica-based. I love the instrumentation, so delicately used and particularly the electronic tweakings beneath. Please discuss the electronic/ambient artists that inspire you? I have been listening to a lot of electronic music: there is so much incredible stuff out there! I really love Amon Tobin, for the unexpectedness and power of his sounds, Four Tet, Nicolas Jaar, Blanck Mass, Laurel Halo, Actress–I could make an endless list! And on the more ambient front, I find Stars of the Lid and William Basinski endlessly beautiful and inspiring. 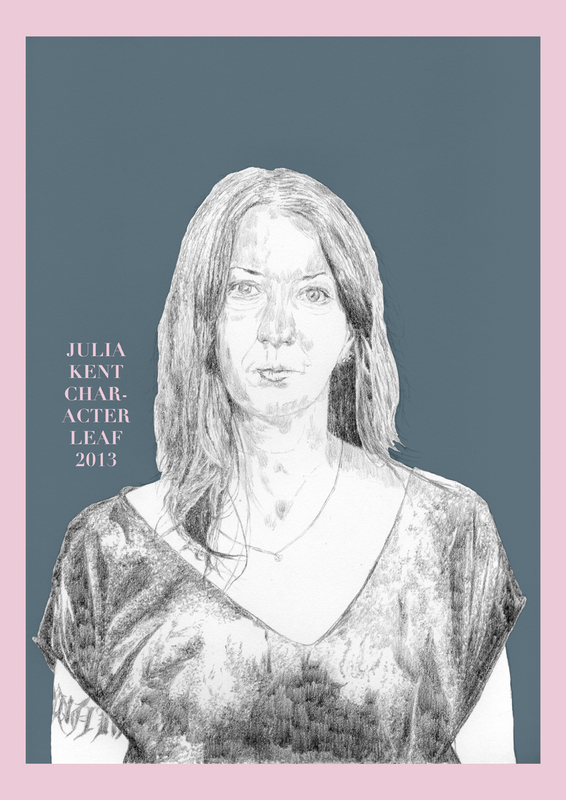 Do you plan to tour Europe on the ‘Character’ tour, Julia? Yes, I’m heading off right now (March/April) for some Italian shows and planning a more extensive European tour in May.